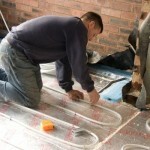 Harrogate Builders – Building Services, Roofing, Loft Conversions in Harrogate and Leeds. New Build, Roofing Services, Loft Conversions and Extensions in Yorkshire. Call us today on 07973 757641. Harrogate builders and roofing services with over 20 years experience, H & S Construction is one of the leading building companies in Harrogate, Leeds and Yorkshire with a strong client base throughout North Yorkshire and West Yorkshire. Our builders undertake all aspects of building works and maintenance ranging from Loft Conversions, Roofing, Property Extensions, New Property Builds and Developments, General Property Maintenance, Kitchen and Bathroom Refurbishments, Ground Works (Patios, Landscaping, Driveways) and general electrical and plumbing works. Our trusted team of Harrogate builders are highly qualified, and deliver a friendly and professional service. Get in touch today for a no obligation quote. The experts at Hands Construction have you 'covered'. Loft conversions are a great way to gain more space. Extend your home with Hands Construction. We can undertake any plumbing work you require.